Cabat's Automatic Overload torque-limiting clutches provide reliable drive-line protection against damage that can occur during a mechanical overload. The Automatic Overload Clutch design incorporates a time proven ball / detent mechanism allowing the clutch to accurately and consistently respond to torque overloads. 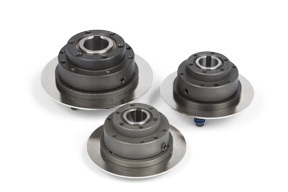 Automatic Overload clutches are best suited for drive-line applications under 500 RPM. All clutches are set at the factory to your torque specifications.